Today, on September 7th. Science and Production Firm Paker, LLC and Kazan Federal University have signed the Partner Agreement in the presence of the President of Tatarstan Rustam Minnikhanov. Joint work in the field of new technologies and oil field development is provided in the document as well as the formation of the whole educational unit for the preparation of specialists who would be able not only to work with current equipment, but also to make a new one. 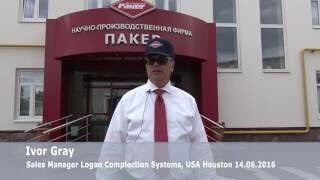 «We do not have «analyst companies» that manufacture equipment. Our PG students are interested not only in science themes but also in problems and needs of companies. Today our technologies can successfully compete with Western ones», said the rector of Kazan Federal University Ilshat Gafurov. This agreement opens the new possibilities as for fundamental and applied sciences as well as for partner companies. Science and Production Firm Paker began its manufacturing with such units of oil production as packers. This equipment is used to separate different layers in oil production. It’s a plug that protects water and other substances entry into produced oil. Since 1992 the company has gone far beyond its first "know-how". Today we produce equipment for oil production and well activity. The director of Science and Production Firm Paker says, «We produce the finished product that can be sold abroad. Russia must be developed not only in the military-industrial sphere but also in the economic one. It is a question of the country's image and growth». In any progressive development there is such a moment when we don’t have our own resources. In this case we talk about in-depth analysis of theoretical, fundamental outposts of oil production and technology. Kazan Federal University has the necessary experience and scientists who are able to represent innovations for a consumer. It’s important right now when Western Companies have closed an access to the market of technologies for Russian oil producing giants. Two years of sanctions have not only created the demand in the domestic market, but also allowed to develop the technology to the sufficient level. The first step in the partnership will be the establishment of special training and practical classes in KFU. Students will be taught how to maintain the company equipment. In the future, we are planning to implement joint developments in the fields of such companies as "Tatneft", "RITEK" and many others.